Using today's communication technology, Accell is "in-house" and available with a keystroke. We can provide you with a secure custom order system which enables you to easily order your print documents online. These systems can incorporate print media management tools such as procurement, re-order, database management and e-commerce capabilities. Talk to us about your e-solution! Does your company have multiple locations or more than one person who is responsible for ordering printed materials? We can help you eliminate your print management and procurement issues with our custom On-line systems. We'll create a custom Web-based ordering site for your company with an online catalog of your products. You control what's on the site and who can order, ensuring consistency, reducing waste and helping you control your inventory. 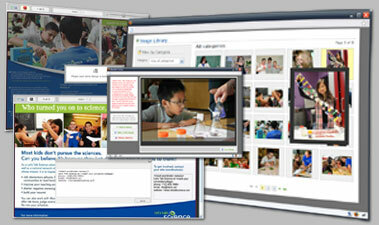 Our Web-to-Print solutions allow customized content editing, proofing and approval all online. After you've approved your order, we'll print and deliver it anywhere required. We'll help you streamline your ordering processes, control inventories and maintain brand consistency from your computer. Contact us to view our existing systems or preview templates. "The Internet is becoming the town square for the global village of tomorrow. "